Gorlin cyst which is, also, recognised by the synonyms calcifying odontogenic cyst (COC), calcifying ghost cell odontogenic cyst, calcifying cystic odontogenic tumor (CCOT) and dentogenic ghost cell tumor, is a rare developmental lesion that arises from the odontogenic epithelium and representing about 2% of all odontogenic pathologies seen in the jaws. Gorlin cyst is clinically characterized as a painless, slow growing lesion which does not have a predilection for either maxilla or, mandible though has a predilection for anterior region of the jaws and usually arises intra-osseously, though, may have an extra-osseous origin, too. It has a peak incidence during the second and third decades of life with a mean age of incidence of 30.3 years with no gender predilection.,,, Radiographically, Gorlin cyst may appear as a unilocular or, multilocular radiolucent lesion with either well-circumscribed or, poorly-defined margins and may, also, be observed in association with unerupted teeth. 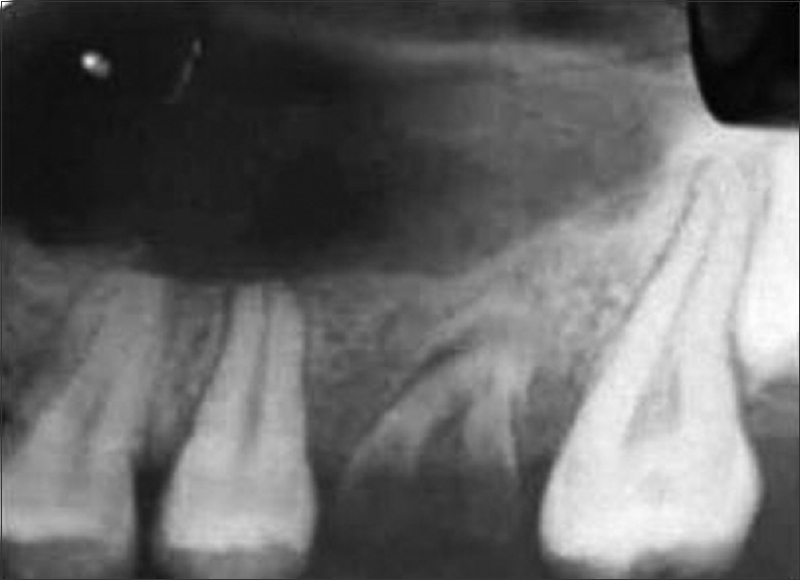 Calcification is an important radiographic sign for the diagnosis of Gorlin cyst and is detected in approximately half of the reported cases.,,, The typical histopathological features of Gorlin cyst include a fibrous wall and a lining of odontogenic epithelium composed of cells resembling ameloblasts. Stellate reticulum-like cells overlay the basal cell layer while ghost cells, which are consistently seen, may occasionally, show signs of calcification., The treatment of choice for Gorlin cyst is conservative and wide base surgical enucleation usually suffices with the treatment. However, recurrence is frequent seen, especially, in neoplastic cases like dentogenic ghost cell tumors. A 21-year-old female patient reported to the Outpatient Department (OPD) with a chief complaint of swelling in upper front tooth region since 6 months with a history of discomfort due to the swelling although no associated pain was reported. 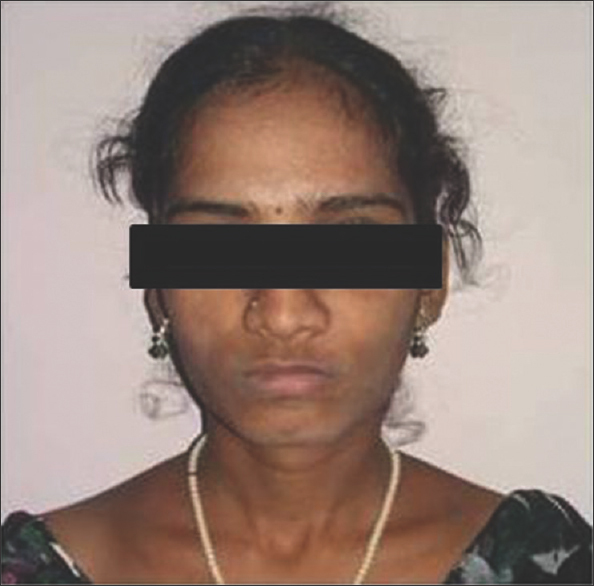 On extra-oral examination, gross asymmetry over left middle third of face [Figure 1] and [Figure 2] was evident, 3 × 3cms in size, hard in consistency and non-tender on palpation. On intra-oral examination, tooth # 63 was found retained while tooth # 23 was missing. Vestibular obliteration was noted in relation to teeth # 22,23,24,25 region was noted with egg shell crackling on palpation [Figure 3]. FNAC was positive yielding 3.8ml of straw colored fluid [Figure 4]. Intra-oral periapical radiograph (IOPAR) [Figure 5] and maxillary left lateral occlusal radiograph [Figure 6] revealed a well-defined periapical radiolucency in relation to teeth # 22,23,24,25 region with root resorption present in relation to teeth # 63, 24 and 25. Orthopantomograph (OPG) revealed a well-defined radiolucency in the same region with impacted tooth # 23 and root resorption in relation to teeth # 63, 24 and 25 [Figure 7]. Based on the patient's history and clinical and radiographic examination, a working diagnosis of dentigerous cyst in relation to tooth # 23 was given with the list of differential diagnoses including adenomatoid odontogenic tumor (AOT), unicystic ameloblastoma and Gorlin cyst. 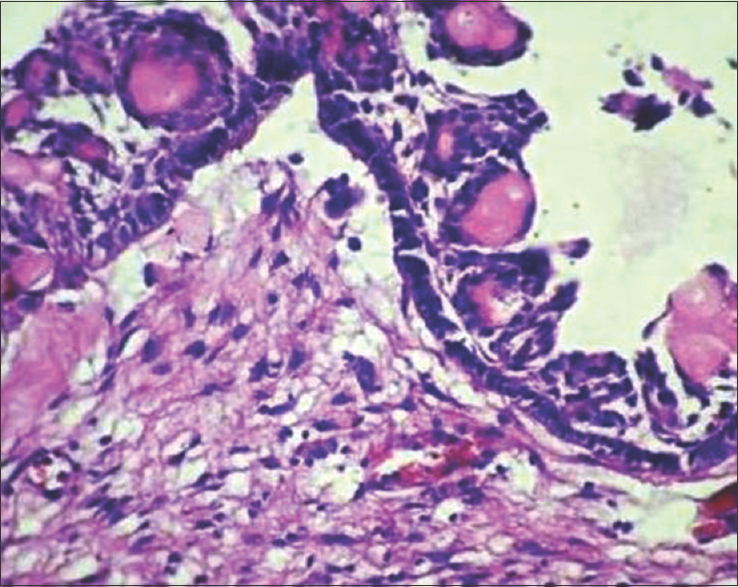 Complete surgical enucleation of cyst was done and the specimen was submitted for histopathological examination which revealed a cystic epithelium of variable thickness along with the presence of ameloblast-like cells, stellate reticulum-like cells and ghost cells with signs of calcification along with numerous bundles of collagen fibers with sub-epithelial hyalinization confirming to a histopathological diagnosis of Gorlin cyst [Figure 8]. A thorough clinical, radiological and histopathological evaluation is mandatory for the diagnosis of this rare but significant jaw lesion of intra-osseous origin. An extensive and meticulous follow-up protocol is, also, equally significant to rule-out any evidence of recurrences as well as chances of malignant transformation. To all the patients who contributed in the study without whom this study would not have been feasible. Gorlin RJ, Pindborg JJ, Odont, Clausen FP, Vickers RA. The calcifying odontogenic cyst – A possible analogue of the cutaneous calcifying epithelioma of Malherbe. An analysis of fifteen cases. Oral Surg Oral Med Oral Pathol 1962;15:1235-43. Pindborg JJ, Kramer IR, Torlini H. Definitions and explanatory notes. Histological Typing of Odontogenic Tumours, Jaw Cysts, and Allied Lesions. Geneva: World Health Organization; 1971. Odell EW, Morgan PR. Benign tumor of odontogenic epithelium. Biopsy Pathology of the Oral Tissues. London: Chapman and Hall Medical; 1998. p. 399-403. Manor Y, Mardinger O, Katz J, Taicher S, Hirshberg A. 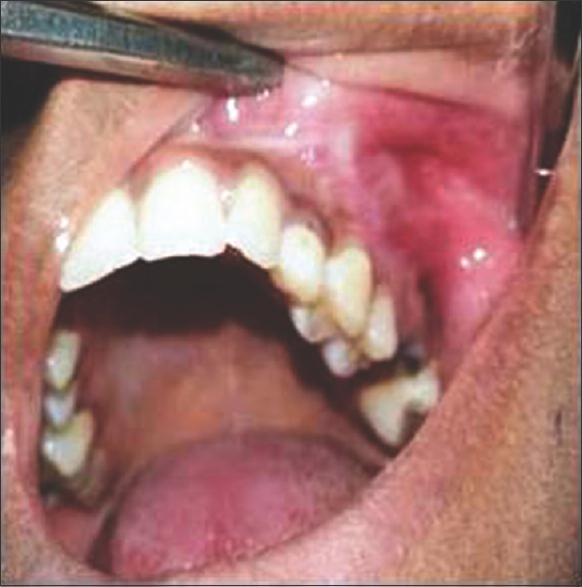 Peripheral odontogenic tumours – Differential diagnosis in gingival lesions. Int J Oral Maxillofac Surg 2004;33:268-73. Orsini G, Fioroni M, Rubini C, Piattelli A. Peripheral calcifying odontogenic cyst. J Clin Periodontol 2002;29:83-6. Resende RG, Brito JA, Souza LN, Gomez RS, Mesquita RA. Peripheral calcifying odontogenic cyst: A case report and review of the literature. Head Neck Pathol 2011;5:76-80. Buchner A, Merrell PW, Hansen LS, Leider AS. Peripheral (extraosseous) calcifying odontogenic cyst. A review of forty-five cases. Oral Surg Oral Med Oral Pathol 1991;72:65-70. Seyedmajidi M, Feizabadi M. Peripheral calcifying odontogenic cyst. Arch Iran Med 2009;12:309-12. Taghavi N, Khodayari A, Sargolzaei S, Mashhadiabbas F, Moshref M, Lotfi A, et al. Recurrent peripheral calcifying cystic odontogenic tumor (Calcifying odontogenic cyst) Iranian. J Pathol 2009;4:141-4. Praetorius F, Piatelli A. Odontoma. In: Barnes L, Eveson JW, Reichart P, Sidransky D, editors. World Health Organization Classification of Tumors. Pathology and Genetics: Head and Neck Tumors. 5th ed. Lyon: International Agency for Research on Cancer Press; 2005. p. 314. 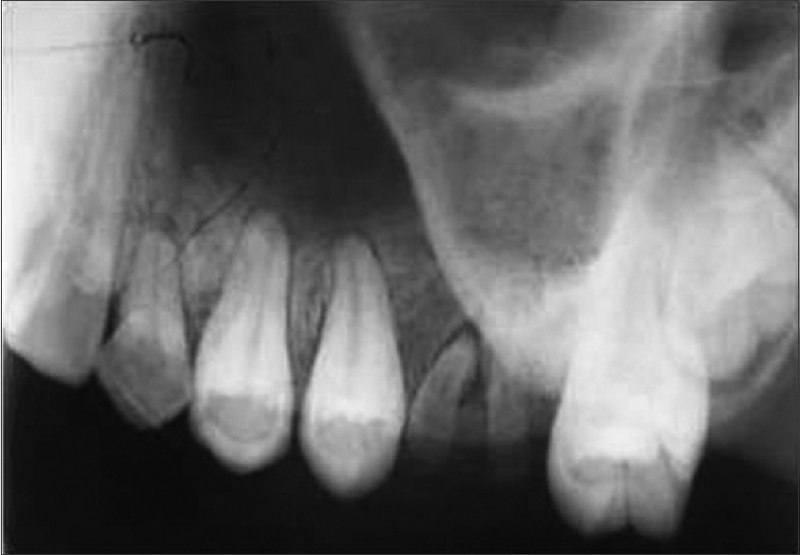 Knezević G, Sokler K, Kobler P, Manojlović S. Calcifying odontogenic cyst – Gorlin's cyst – Report of two cases. Coll Antropol 2004;28:357-62. Sakai VT, Filho CE, Moretti AB, Pereira AA, Hanemann JA, Duque JA, et al. Conservative surgical treatment of an aggressive calcifying cystic odontogenic maxillary tumor in the young permanent dentition. Pediatr Dent 2011;33:261-5.